The Sailor's Present, or the Jealous Clown, by Carington Bowles from John Collet, 1778, British Museum. "Clown" had a different connotation in the eighteenth century. In Samuel Johnson's famous "Dictionary of the English Language," he defines a clown as "a rustick, a churl" or "a coarse ill-bred man." In this scene, the clown is the fellow in the back with the tattered coat, scratching his head and gesturing to the cows. 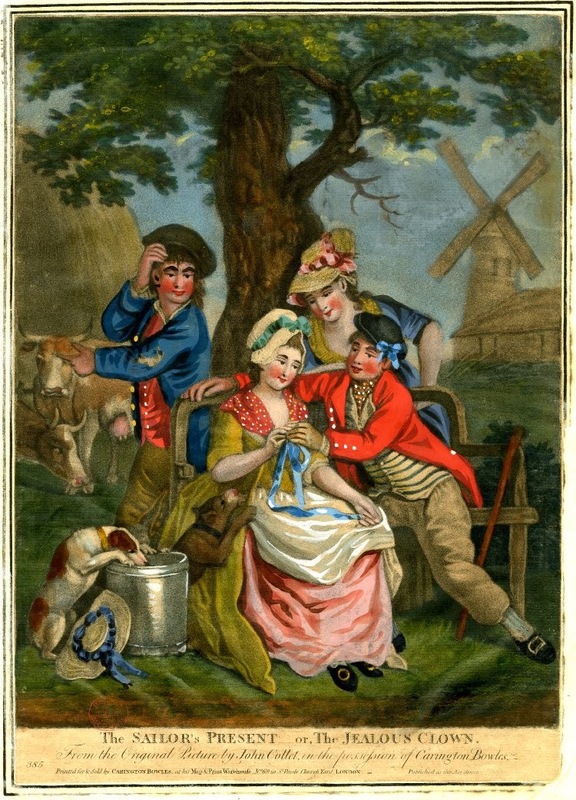 His jealousy is direct at the sailor, who boldly reaches for the breast of a handsome young woman with a blue bow. There's a lot to be said about this image, but we're going to focus on the sailor. He wears a black round hat, with the edge of his short brim upturned. A blue bow is fitted to the left side, not unlike some we've seen in previous images of sailors in shore-going clothes, though notably this is common of Carington Bowles' work. His jacket is red, an unusually bright color for sailors. It is single breasted with white metal buttons, matching those on his slash cuffs which are buttoned. There is a single button peeking from the back of his jacket, which suggests a vent. There is no evidence of pockets or collar. His neckcloth is brown spotted in yellow and white, and tucked into his waistcoat, concealing any sign of his shirt. The single breasted waistcoat is fitted with cloth covered buttons. Blue horizontal stripes cut across the off white fabric. His trousers are dark, nearly brown. They end above the ankle, showing us blue or gray stockings with (if you look carefully) vertical stripes of a darker color! 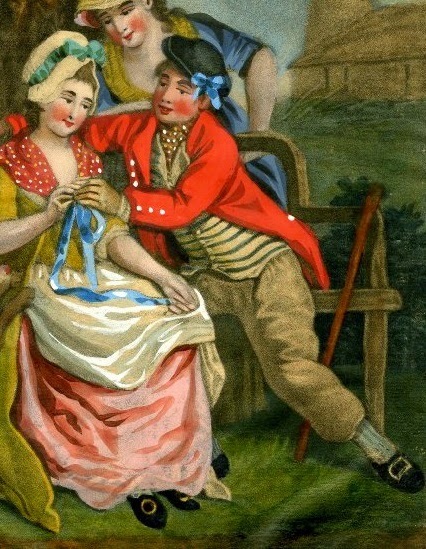 Striped stockings, so common in modern portrayals of eighteenth century sailors, were not the most common in period images of them. This is the first image I've found to show striped stockings, and the decoration is decidedly subtle. The shoes are pointed toe with rectangular buckles. Beside him rests his trusty walking stick.